Connecting Hearts...One Beat At A Time. Since Aortic Hope was founded in 2016, we have helped to provide support to over 2000 individuals within the community and we are still growing! Initially, our Hope Mail Care Packages were sent to 30 people and now that program has grown by almost 500%! Our live educational videos are spanning the globe! In addition to a strong online presence, our community outreach is enabling us to expand our mission globally. Other than the United States, Aortic Hope has reached individuals in Canada, Australia, Sweden, UK, India, Angola and more! 100% of your donated dollars are turned around and given back to the community through our initiatives. Aortic Hope is a community of Aortic Disease patients, survivors, and caregivers. We Spread Hope, Create Awareness and Provide Support to patients, survivors, and caregivers during the recovery and management of aortic disease. Aortic Hope strives to Spread Hope, Create Awareness and Provide Support in a variety of ways. Donations are used for the programs listed below and so much more! If you are interested in becoming a Hope Ambassador, assisting with the Tableside Information Card Program or if you are a Physician and would like information to distribute to your patients, please click the button "Learn More" below. We are now offering our "Heart to Heart" program. Aortic Hope's Heart to Heart program aims to connect people, on a one-to-one basis, with the goal being to provide each other support while recovering from and living with aortic disease. This includes survivors and caregivers. Aortic Hope's goal is to be seen as the post-operative/patient advocacy group to turn to for support. We provide Hope, Support, and Awareness to the community. By providing virtual support groups, we are by no means inferring we are therapists or doctors. We are only providing the means in which individuals from around the world can connect "face-to-face” in a safe, secure environment without leaving their homes. Q&A events are live interviews on facebook involving physicians, surgeons, mental health therapists, and more. Individuals are able to interract by listening to topics pertaining to Aortic Disease and ways to manage it. Community members are able to ask questions in real time or submit them for follow-up later. As a Hope Ambassador, you will may be working with physicians and hospitals, assisting/hosting fundraisers or participating in speaking engagements. This will help provide emotional support to patients who have survived an aortic dissection or who will be undergoing open heart surgery for an aortic repair. Marketing pieces can be sent to your physician to be displayed in the office. Aortic Hope's Heart to Heart program aims to connect people to provide each other support while recovering from and living with aortic disease. This includes survivors and caregivers. Participants must be 18 years or older and may include caregivers, dissection and aneurysm survivors. If you are interested in providing support to someone in an one-to-one basis, or if you are looking for support, this is the program for you! Do you have an aortic aneurysm or have you had an aortic dissection? Do you want to be active but are uncertain about what types of exercise are safe? Are you confused by exercise restrictions? If you answered yes to these questions, we invite you to participate in a new study at the University of Texas at Houston (UTHealth) led by Dr. Siddharth Prakash, a cardiologist at McGovern Medical School. · Dr. Prakash and his study team will measure your blood pressure during routine activities and while you perform different types of exercise. · We will also measure the size and stiffness of your aorta using a new ultrasound test that may help us to provide more individual care to patients with aneurysms and dissections. · These tests are free, do not involve needles or drugs, and will take only 2-3 hours of your time, but you will have to travel to our clinic at the Texas Medical Center in Houston. · At the end, we will meet with you to explain how your results can help you to stay safe and increase your overall cardiovascular health while you exercise. Aortic Hope is pleased to announce our new relationship with Lauren’s Hope Medical ID Jewlery! Lauren’s Hope is very excited to be able to offer everyone in the Aortic community a 10% discount simply by using AORTICHOPE as the promo code!!! ”In 2001, Lauren’s Hope introduced the very first interchangeable medical ID bracelet, and overnight, people who had grudgingly worn, or even refused to wear, the standard, plain metal medical ID bracelets of the past suddenly had attractive, durable, stylish options they could enjoy wearing and change to suit their mood, outfit, or activity. Today, more than 400,000 people wear Lauren’s Hope medical IDs every day, and we’re proud to say that number just keeps growing. Medical ID bracelets serve many purposes but their main objective is to assist healthcare professionals and first responders to get an in-depth view of the patient’s medical condition so that proper treatment can be administered without delay. The bracelet is of immense help when the patient is not able to communicate clearly. Aortic Hope is an official 501(c)(3) charity. Any donations given to Aortic Hope may be tax deductible retroactive to June 2017! Click the picture below and enjoy the video! 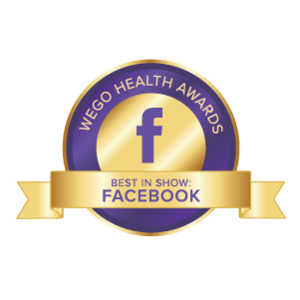 Aortic Hope is excited to announce that we were nominated for: Best In Show: Facebook at WEGO Health!!! Facebook is a community all its own. Over the past few years, it has transformed from a place for a personal profile to a real hub for discourse, conversation, and community. Who has the best Facebook Group or Page of anyone you know? Who utilizes Facebook Lives to amplify their patient advocacy? The winner of this category has balanced the ever-changing interface of Facebook and has turned it into an opportunity to reach more people. This Patient Leader fosters an environment where people want to "Like" and interact. They may have other social media sites, but he or she really utilizes all the tools Facebook has to offer and shows how it can be used for good! WEGO Health is a mission-driven company connecting health care with the experience, skills and insights of Patient Leaders. WEGO is the world’s largest network of over 100k Patient Leaders, working across virtually all health conditions and topics. Their network collaborates with pharmaceutical and life sciences companies, agencies, consultancies, startups and all types of organizations across healthcare. WEGO Health offers enterprise and on-demand solutions that allow organizations to leverage the patient experience and expertise in the design, development and promotion of their products and services. "Aortic Hope....we need more groups like this in the world." Aortic Hope is..."Awesome! Filled with great information! Great people. People from the group reached out to me and that's important." "This group educates and increases awareness of aortic disease and allows others to appreciate the dramatic impact it can have on the lives of those afflicted and their loved ones. Through our work together we can turn many of these would-be emergency operations into safer elective procedures. We can educate the family of patients with aortic disease to get screened with echocardiography and CT or MRI imaging. And we can support those who carry these diagnoses along the way." "Today was my 4 year aortaversary!!! So very thankful for each day I am given! Blessed for this community of people who have been through the same life altering events!!! And grateful for a 2nd chance!!!" "Aortic Hope is all it's name says and more! Giving hope through inspiration, education & genuine concern. They have created a "World-Wide" community of comradery among Aortic Survivors, Caregivers & Families! There's always room for you, too!" Would you like to be involved with Aortic Hope by Spreading Hope, Creating Awareness or Providing Support? Maybe you would be interested in receiving some Hope in the mail? Please take a look at some options below, we would love to hear from you! Share your amazing story of survival, or as a caregiver, with the community. Sign up to receive some Hope in the mail, at no cost to you!